Tim Farron called the rumours "wicked"
Liberal Democrat party president Tim Farron has hit out at “wicked” rumours that he was blackmailed over a “secret gay life”. The married MP, who has been accused of plotting to oust party leader Nick Clegg, said the gossip began in his Lake District constituency earlier this year. He said local rumours had falsely linked him to a case where a “respected” member of the local community had been blackmailed over his private life. Mr Farron, who was speaking to Total Politics magazine, did not name those he believed responsible for the gossip. The MP, who is a committed Christian, has been criticised for his voting record on LGBT issues. 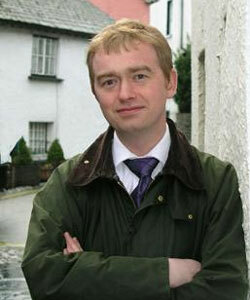 According to research by gay rights charity Stonewall, Mr Farron, who was elected as MP for Westmorland and Lonsdale in 2005, was absent for all but three votes on gay equality. In those he did attend, he voted against the Equality Act and for ‘free speech’ protections in homophobic hatred laws. Mr Farron has said Stonewall’s analysis was unfair and that he took a “heavily liberal line on freedom of organisation and choice”.